Compared to the other spaniel breeds, the Sussex Spaniel has a more relaxed demeanor. For this reason, it is successful in the home as a house pet even in a city environment. The Sussex Spaniel still welcomes the opportunity to hunt, however it is not as preferred by hunters as some other breeds due to its tendency to be noisier in the field. It has a tendency to bark or howl when left on its own, particularly if there are other things going on. However, generally in the home the Sussex Spaniel tends to be a laid back and serene house pet. Although it may appear serious or dull due to its natural facial expression, the Sussex Spaniel is actually a lively and joyful breed. The Sussex Spaniel does require some physical activity daily. A strong walk or an eventful play session outdoors can satisfy the exercise needs of this breed, but ultimately a run in a field would be ideal. The Sussex Spaniel does well as a family dog in the home as long as it has access to both the indoors and outdoors. The coat of this breed needs the occasional brushing or combing approximately every other day or so. One of the major health concerns for the Sussex Spaniel is commonly referred to as Canine Hip Dysplasia, or CHD. CHD involves a displacement or issues with the development of the hip. A second major health concern for this breed is Intervertebral disk disease, which is an issue that affects the back. Minor concerns for the Sussex Spaniel include otitis externa, heart murmurs, and an enlarged heart. The average life span of a Sussex Spaniel with no health concerns is 11 to 13 years. The Sussex Spaniel is referred to in publications as early as 1820 where it was noted for being a quality working breed. Originally referred to as “Spaniels of Sussex”, the breed’s name originates from Sussex, England where the first kennel of these dogs existed. The popularity of the Sussex Spaniel eventually spread throughout Sussex County and its surrounding estates. The breed was proficient as a shooting dog with a strong ability to use its nose to hunt. However, the Sussex Spaniel tended to be vocal when on scent, causing the breed to be less desired in the early 1900s since a quiet hunter was the preference. It also tended to move slow, which worked against the breed as a fast hunter was favored. The Sussex Spaniel is one of the first ten breeds to be recognized by the AKC. It was also one of the first breeds to participate in dog show competitions; however it has not ever gained notoriety as a strong competitor. The Sussex Spaniel has faced the possibility of extinction several times throughout the twentieth century which has caused the need for inbreeding more than is usually preferred to keep the breed alive. 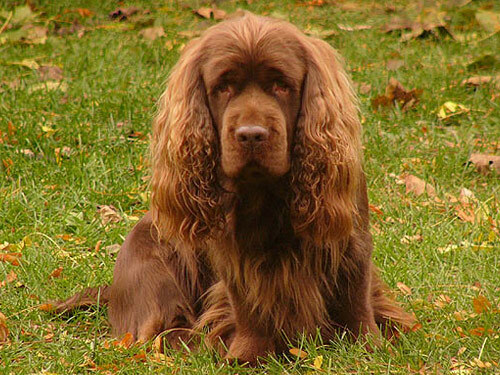 In an effort to expand the gene pool, the Sussex Spaniel was crossed with the Clumber Spaniel in 1954, however the gene pool is still limited since the breed is so rare.